Coffee's Effect On The Endocan..
Grand Rapids, Michigan, is famous for many things. Depending on your age, you might know it as the childhood home of President Gerald Ford, as the birthplace of Red Hot Chili Peppers frontman Anthony Kiedis, or possibly as Beer City USA. Ah yes, the beer. Grand Rapids has made quite the name for itself in the world of beer over the past few years. The city features such breweries as Founders, Atwater, New Holland, Hopcat and many more (almost 40 actually), making it a must-visit destination for beer lovers everywhere. 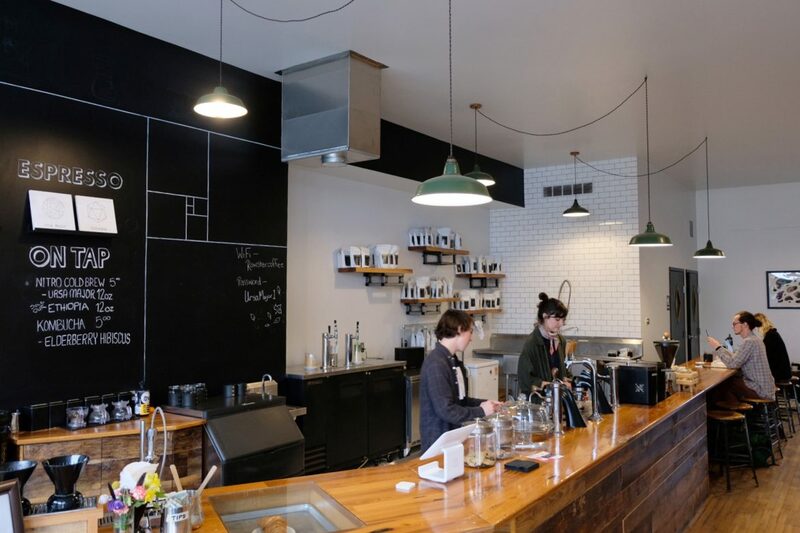 But beer isn’t the only beverage for which Grand Rapids is known these days: the coffee scene here, already formidable for years, is growing steadily—from neighborhood cafes to world-famous roasters, there’s something for every taste and preference. So the next time you’re in Grand Rapids, whether to take part in the Ale Trail or visit Anthony Kiedis’ childhood home, here are some coffee shops to help caffeinate your trip. Any coffee tour of Grand Rapids has to start at Madcap. With three cafes and a roastery in the city, and wholesale accounts stretching the length of the country, Madcap, arguably the city’s first true specialty roaster, has gained quite the reputation—one stretching well beyond Grand Rapids. Their flagship cafe at the corner of Monroe Center and Ottawa Ave in downtown Grand Rapids is the perfect encapsulation of everything Madcap stands for. The big, open plan space, all white paint, and exposed brick exude a simple elegance, allowing the clean branding and immaculate service to shine. Atop a long low-profile bar, a matte black three-group La Marzocco Strada cranks out espresso drinks, with the assistance of Mahlkönig PEAK and Nuova Simonelli Mythos One grinders, while pour-over coffee is ground by an EK43 and brewed by a pair of Wilbur Curtis Seraphim brewers (all also in the same matte black). Madcap’s impressive selection of retail coffee is on display, alongside a small but solid food menu (ice cream sandwich, anyone?). Due to its central location (and reputation), Madcap’s Monroe Center cafe is always busy, but it’s worth braving the crowds to see what all the fuss is about. 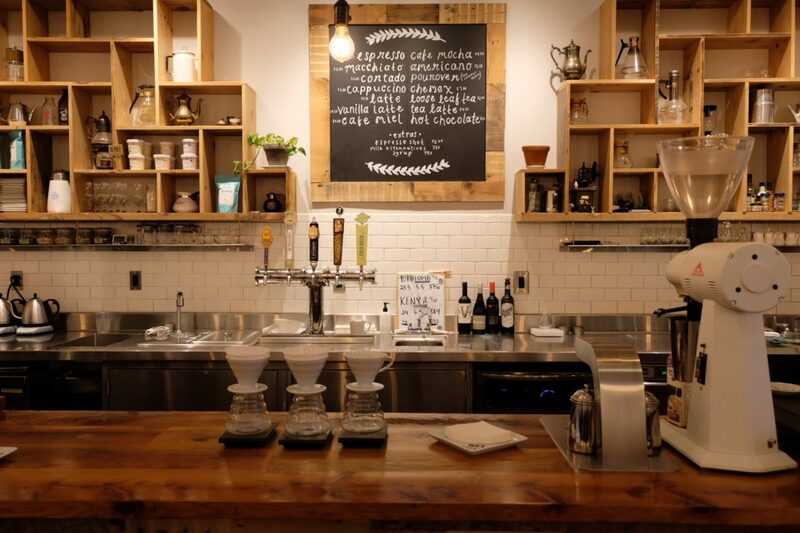 Madcap Coffee has multiple locations around Grand Rapids. Visit their official website and follow them on Facebook, Twitter, and Instagram. Just a few blocks due south of Madcap’s flagship lies Lantern Coffee Bar & Lounge. A comfortable, welcoming mood pervades Lantern, from the local art on the walls to the basement seating area. Oh yes, the basement. The upstairs part of Lantern is mostly taken up by the bar—where Bay City’s Populace Coffee Roasters is served on a La Marzocco Strada or various manual brew methods—and a couple of armchairs. Downstairs, however, lies a quiet, inviting brick-walled space, with wooden beams, rustic pillars and lots of comfortable seats. Atmosphere is provided by the small, high windows (this is a basement, after all), and soft mood lighting. Lantern feels like your favorite local coffee joint, and its hidden-away basement style adds to the speakeasy charm. Couple that with quality coffee, a wide selection of pastries and a commitment to sustainability, and you’ve got yourself a worthy stop on any coffee tour. Lantern Coffee Bar & Lounge is located at 100 Commerce Ave SW, Grand Rapids. Visit their official website and follow them on Facebook, Twitter, and Instagram. Over the Grand River to the west lies Ferris Coffee & Nut, the sprawling cafe and retail location of this 94-year-old Grand Rapids institution. Part coffee shop, part candy store, Ferris serves an array of inventive drinks, many of which incorporate their rotating selection of house-made nut milks—a growing trend Ferris, a nut roaster, has been able to take the inside track on. The cafe itself, newly renovated, is large and bright, with a big communal table and low, fashionable armchairs before floor-to-ceiling windows. The marble-topped bar holds a three-group Synesso Cyncra, alongside Mahlkönig PEAK and K30 grinders, while the polished concrete floors make everything inside sparkle warmly, even on a grey Midwestern day. The drink menu is extensive, with cold brew and pour-over options accompanying the usual espresso suspects—all anchored by their array of nut milks. They also serve sandwiches and a selection of pastries, and if you venture into their retail store you can find a host of nuts, candies, and chocolate for sale, alongside the requisite bags of coffee. Ferris Coffee & Nut has multiple locations around Grand Rapids. Visit their official website and follow them on Facebook, Twitter, and Instagram. In the Heritage Hill neighborhood, Lyon Street Cafe sits on the street from which it takes its name. Nestled between a home brew supply store and a bakery, with a wine store and a pizza parlor in close proximity, Lyon Street feels like the very definition of a neighborhood cafe—which is what it turns out to be. Long and relatively narrow, Lyon Street’s white-painted brick walls make it feel bigger than it is. Booth seating lines one wall (booth seating is always a good idea) while the bar runs along the other; in between are high two-top tables which give a nice elevated view of the cafe. Lyon Street’s coffee lineup rotates (they recently showcased Cat & Cloud from Santa Cruz, CA). A shiny La Marzocco GB5 combines with a Mahlkönig K30 grinder, while a white EK43 and a row of Hario V60s take care of manual brews. If you’re not in the mood for coffee, beer on tap and a selection of wines are also available. Anchoring a row of neighborhood shops is no easy task, but judging by the number of people visiting on a Saturday afternoon in October, Lyon Street is a doing a very good job. Lyon Street Cafe is located at 617 Lyon St NE, Grand Rapids. Visit their official website and follow them on Facebook and Instagram. Wealthy Street, where the final three cafes on our tour reside, runs east-west almost the entire length of the city, and the slice that contains Rowster definitely fits the name Wealthy—this is an ultra-hip district, with boutiques, breweries, and bars stretching into the distance. Rowster Coffee sits unassumingly on the corner of Wealthy and James, their flagship location showcasing simple, clean design and a thoughtful approach to coffee. There’s a lot to like about the interior, with its subdued color palette and minimal seating. It gives the cafe a sense of space and serenity, a feeling that is only enhanced by the laid-back, eclectic music selection. While Rowster is, as the name suggests, a coffee roaster, they’ve moved their roasting operation offsite, allowing the cafe to concentrate on the brewing and serving of coffee (retail bags are, of course, available to take home). The bar area takes up about half of the space, with a low wood-topped counter backed half by chalkboard paint and half by subway tile. A Modbar under-counter espresso machine and pour-over system mean there’s no barrier between the customer and the barista preparing their drink, adding to the sense of openness and giving the cafe the feel of a hip cocktail bar or an upmarket diner. As with all good coffee shops on lively streets, the bar seats in Rowster’s huge front window are the ideal spot to while away an afternoon, sipping a draught cold brew or kombucha and watching the denizens of Wealthy St. go about their fashionable lives. 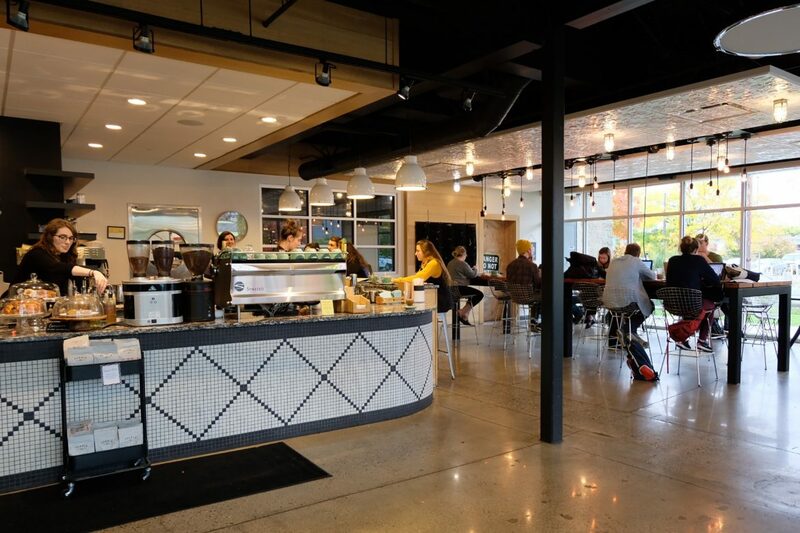 Rowster Coffee has multiple locations around Grand Rapids. Visit their official website and follow them on Facebook, Twitter, and Instagram. A few blocks down Wealthy St. into the East Hills neighborhood sits Squibb Coffee & Wine Bar, artfully blending daytime with nighttime to offer both caffeinated and alcoholic drinks (as well as cheese and various small plates). Squibb (named for the owners) has a light, airy feel, with white tables and an imposing white bar, atop which squat a Kees Van Der Westen Mirage espresso machine and Mahlkönig PEAK grinder. Exposed ductwork and industrial-chic light fixtures are met with a mural of a giant squid on one wall, for a playful touch. 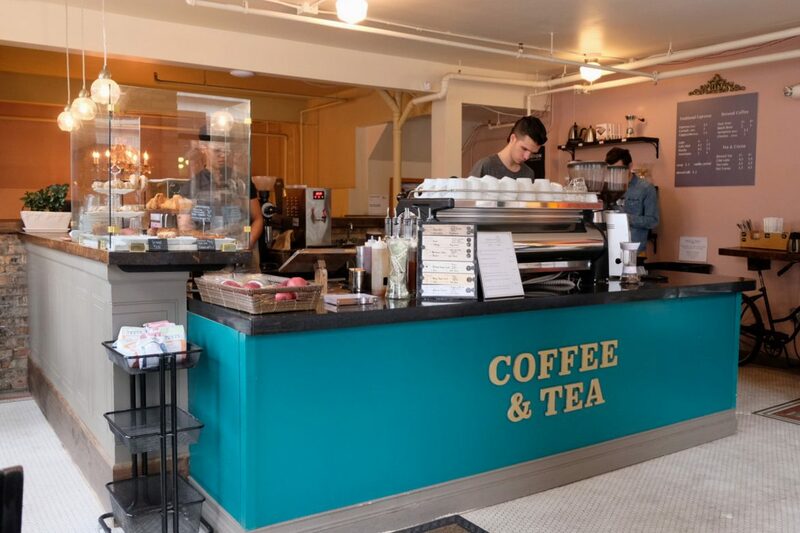 Coffee is provided by Populace, as well as rotating guest roasters from around the country, and there is also an extensive tea selection courtesy of Rishi Tea. Cheese and charcuterie round out the menu, accompanied by toast and a selection of small plates and snacks. The combination coffee and wine bar is a smart idea in this part of the world, as during the long Michigan winters customers can come in for a coffee in the morning and happily get snowed in, safe in the knowledge that wine and cheese are available for later on. Squibb Coffee & Wine Bar is located at 955 Wealthy St. SE, Grand Rapids. Visit their official website and follow them on Facebook and Instagram. 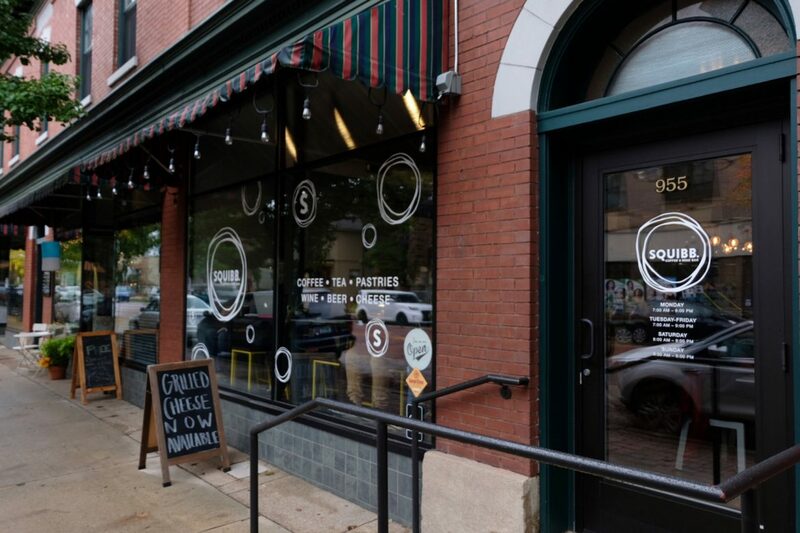 The final stop on our Grand Rapids coffee tour is only a block down from Squibb, but has a charm that’s all its own. Small, cozy and friendly, The Sparrows is a local landmark in the East Hills neighborhood. 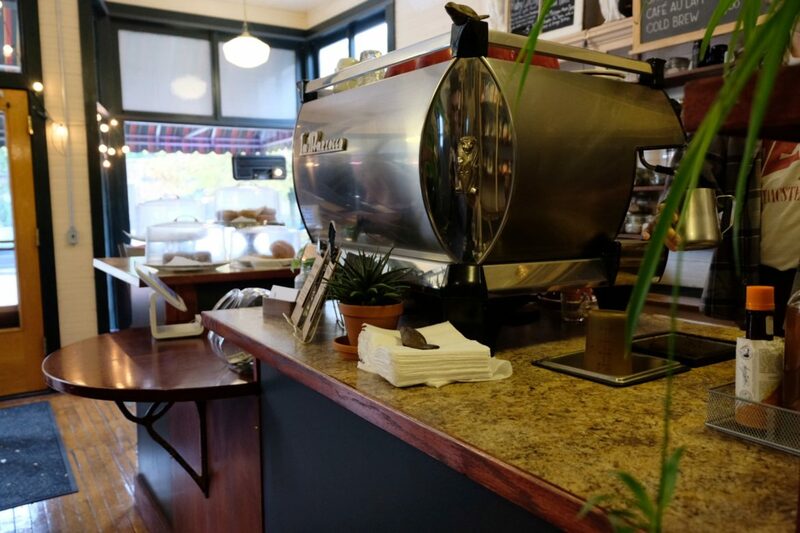 Housed in a standalone former hardware store, The Sparrows has been in business for more than 10 years, and they recently began roasting their own coffee on the west side of town. The cafe on Wealthy St. is warm and inviting, with high-backed armchairs in the front window and a row of two-top tables running along the wall opposite the bar. A La Marzocco GB5 produces an extensive list of creative specialty and seasonal drinks in addition to the classics. Where The Sparrows really stands out, however, is in the third part of the name. Along the wall opposite the bar runs a rack of magazines and newspapers, from The Atlantic to Fader and The Detroit Free Press—although a sign asks customers to purchase them before reading, implying an awkward conversation in the past. The Sparrows’ combination of coffee house and newsstand is both reassuring and necessary, as the role of community spaces becomes ever more important and access to print journalism dwindles. Being able to pick up a local newspaper or political magazine alongside your morning latte is a rare gift, and should be cherished. The Sparrows Coffee & Tea & Newsstand is located at 1035 Wealthy St SE, Grand Rapids. Visit their official website and follow them on Facebook, Twitter, and Instagram. Fionn Pooler is a journalist based in Ann Arbor, Michigan, and the publisher of The Pourover. Read more Fionn Pooler on Sprudge. Top photo by Rachel Liu.